The 35-year-old Saudi Crown Prince Mohammed bin Salman (MbS) became heir apparent in 2016. Although he began his regime with a series of modest if widely-publicized reforms, these were designed to disguise his true despotic aims. Jamal Khashoggi was a Saudi journalist who was critical of MbS, who portrayed him as the tyrant he is at heart. For this, MbS had Khashoggi brutally murdered. Jared Kushner is chummy with MbS. Donald Trump is a staunch supporter. Both men have ulterior motives for siding with the Crown Prince. Charles Kushner, father of Jared Kushner, asks Qatar for a loan to bail out the troubled property at 666 Fifth Avenue in Manhattan. The Qataris turn him down. Saudi Arabia organizes a blockade of Qatar, a country where the US has a major military base. Kushner leads the extreme minority view in the West Wing to support the blockade. To the consternation of the State Deptartment, Donald Trump praises the move. After his criticism of Donald Trump gets him banned from Saudi media, Jamal Khashoggi leaves the Kingdom for the Beltway. Khashoggi begins writing for the Washington Post. Jared Kushner pays unannounced visit to Riyadh, where he stays up until the wee hours talking “strategy” with Crown Prince Mohammed bin Salman (MbS), his new BFF. He gives MbS an “enemies list” culled from the classified President Daily Brief. Kushner’s company receives a $57 million loan from a subsidiary of SoftFund, the Saudi investment concern, to bail out its troubled property at One Journal Square in Jersey City. Khashoggi reports that the amount seized from Al-Waleed is $110 billion — the same amount as the proposed US-Saudi arms deal. A Qatari-funded investment company grants the bailout loan to the Kushners. US IC become aware of a plot by MbS to lure Khashoggi back to the Kingdom, and there to detain him. Trump and Kushner are almost certainly told of this. Neither lift a finger to help the journalist. Jamal Khashoggi goes to the Saudi consulate in Istanbul, to secure documents that would allow him to marry his fiancee, a Turkish national. He is detained, and a Saudi kill squad with intimate ties to MbS tortures him, kills him, and dismembers his body. The Turks announce that they have recordings of all of this. An initial report that the recording was made by Khashoggi’s Apple Watch is a cover, as the Turks had the consulate bugged. First, Saudi Arabia denied any wrongdoing. After days of hand-wringing, they finally admit that yes, he died in the consulate and they are investigating. Trump suggests the assassination was the work of “rogue killers.” Mike Pompeo flies to Riyadh, where he and MbS attempt to cook up a plausible cover story. The best they can come up with is that Khashoggi, who was almost 60 years old and not to be confused with Conor McGregor, got into a fistfight with the 15 men (!) sent to interrogate him, a group that included members of MbS’s security detail and an autopsy doctor, and he died accidentally. Trump and Kushner both accept the obviously fake story at face value. Trump goes to a rally and praises a GOP comrade who got rough with a journalist, implying that if given the chance, he too would welcome the opportunity to murder a reporter he thought was too critical. A despotic regime in Saudi Arabia is bolstered by a despotic regime in the United States. 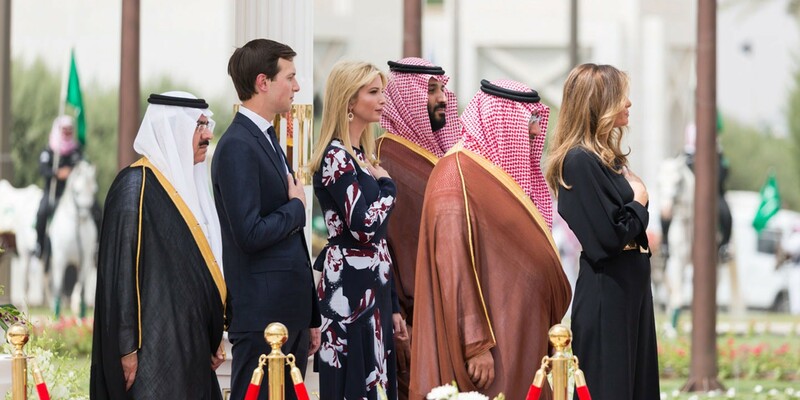 The people ruled by a puritanical and retrograde religious sect, women veiled and denied basic rights and privileges, censorship of speech and the press, infidels (including unbelievers, LGBTQ, dissidents) beheaded, and the vast resources controlled by a small circle of oligarchs…this is Saudi Arabia today, and what the GOP wants in this country. (@gregolear) is the author of DIRTY RUBLES: AN INTRODUCTION TO TRUMP/RUSSIA, and the novels TOTALLY KILLER and FATHERMUCKER. He lives in New York.